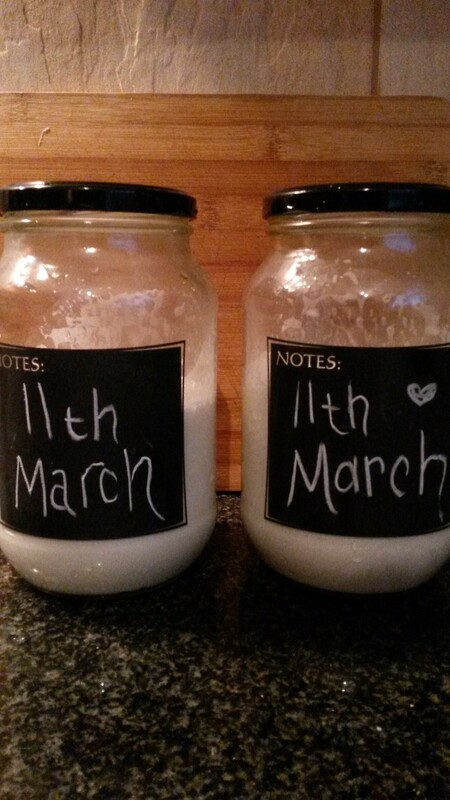 My first batch of SCD yoghurt was delicious, but it didn’t really agree with me, which is sad. You can read more about it here and here. I’ll try it again in the future when my gut has had more time to heal. If you are able to handle nuts, you should definitely give it a try. The flavour was wonderful. This week, I attempted to make the yoghurt again, this time using almond nut milk instead of whole (ground) almonds. The yoghurt has turned out wonderfully, though I’d make it a bit thicker next time. Here’s how I did it, step by step. About 3 days before you’d like to have your yogurt (remember, this is SCD, so everything takes a little longer! ), take 2 cups of blanched almonds and soak them, uncovered, for up to 2 days. 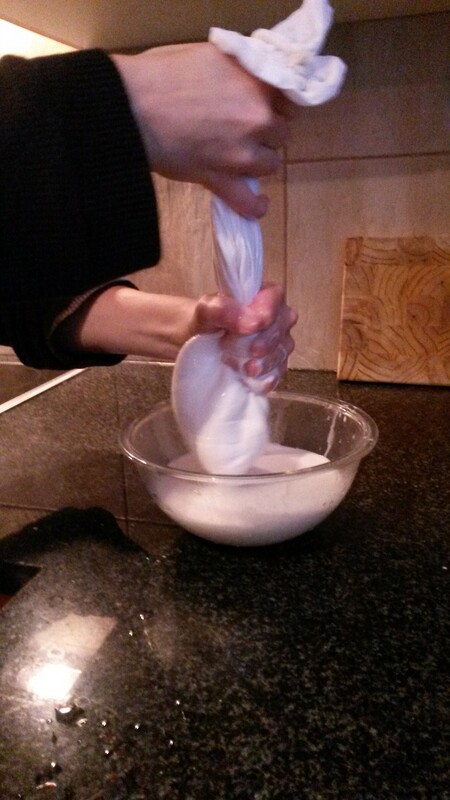 You can soak them overnight to shorten the process, but the longer you leave them, the creamier the milk will be. Working with unblanched almonds: If you, like me, have unblanched almonds, simply plop them into a bowl of boiling water for a few minutes, and then you’ll easily be able to squeeze them out of their skins. K helped me with this, and we turned it into a bit of a competition! Once you’ve finished soaking your nuts, give them a good rinse, and then add them to your blender with 2 cups of water per cup of nuts – so four cups of water in total. I did mine in two batches. First, pulse the blender a few times to break up the nuts, and then blend at full speed for 2 minutes. The nuts should be nicely broken down at this stage. Next, you need to strain your milk. Take a sieve and line it with cheesecloth or, in my case, a nut milk bag. Place it over a clean bowl, and pour the nut milk into it. Then, gather up the bag or fabric, being careful not to spill, and squeeze out as much of the milk as you can (using clean hands!). You should get about 2 cups of milk for every 1 cup of nuts. I didn’t have time to make my yogurt right away, so I refrigerated the almond milk in clean jars. There’s debate about how long it can last in the fridge – some say 2 days; others say 2 weeks. Your nose will certainly tell you if it has gone off. I added some to my coffee this morning, after 5 days in the fridge, and it seems fine. Now the fun part! Heat your almond milk, together with 1 tbsp honey and 1tsp vanilla extract, gently on the stove in a large pot or Dutch oven (I used the latter). I used 1 litre of milk. Actually, when I say ‘I’, I mean K, because she did this part for me while I was stuck working late! Keep the heat low and stir constantly to avoid scalding the milk. When it reaches 185F (85C), remove it from the heat. Be sure to stir it before you take temperature readings. Now, let it cool down. I sped up this process by putting the pot in a sink of iced water. Keep an eye on it if you do it this way – it can cool more quickly than you’re expecting. In the mean time, mix 4 tsps of gelatin with 1/2 cup room temperature water. I used 3 getaline leaves (1 leaf = 1 tsp), but I definitely think more was required. You might need to play around here. 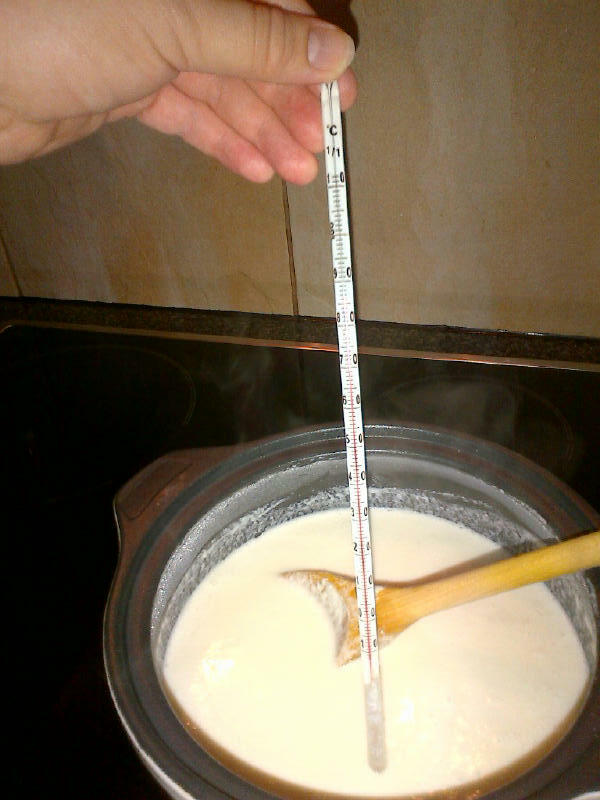 When the yogurt reaches 110-120F (43-49C), add your gelatine and mix it in using a stick blender. Then, when the yogurt reaches 100F (37/38C), add your yogurt starter, and again use your stick blender to fully incorporate it in the mixture. How much yogurt starter? The guys at SCDLifestyle.com suggest using 1/8 of a tsp for every 2 quarts, which is what I use. So you’ll need 1/16 of a tsp for 1 litre, if my maths (and conversions!) are correct. Now, transfer your mixture to your sterilised yogurt maker container (or whatever containers you’re using) and place into your yogurt maker for 12 hours only. Do not touch, shake, move or disturb the yogurt maker at all during this time, as the culturing process is extremely sensitive to movement. 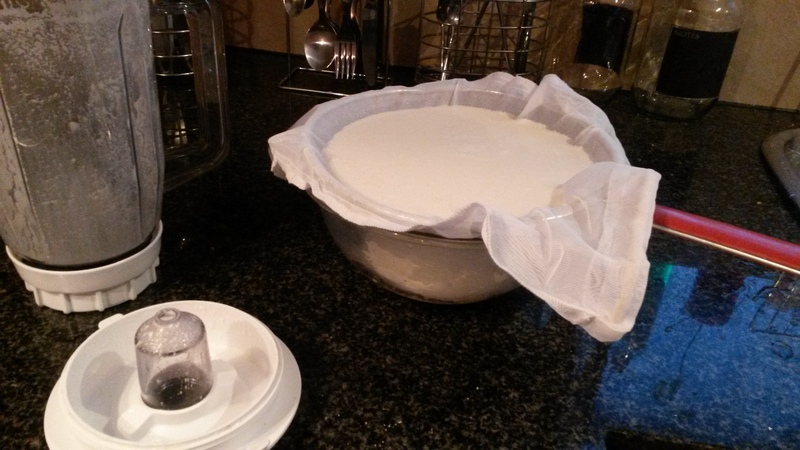 After 12 hours, carefully remove the yogurt from the yogurt maker and allow it to sit for 1 hour. At this point, some people stir the yogurt while others believe that it’s still very sensitive to movement. I don’t touch it. Lastly, place it in the fridge for at least 8 to 10 hours, which allows the gelatine to thicken. My batch is a bit thin, but definitely closer to the consistency and taste of real yoghurt, so I’m really thrilled. 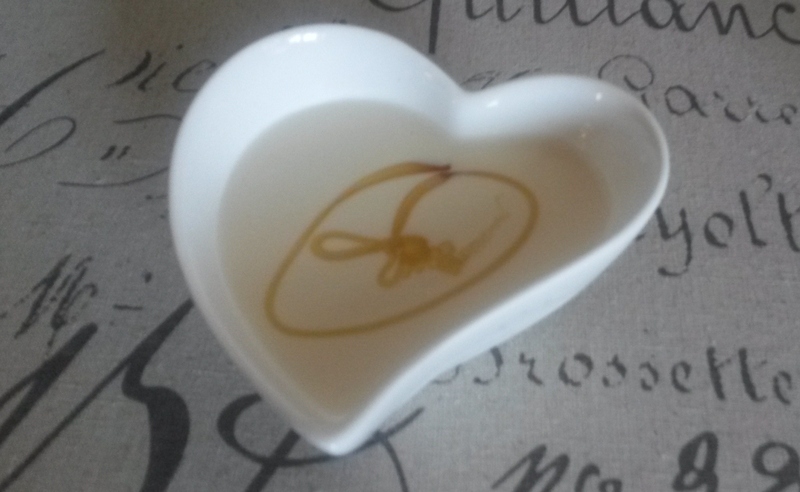 I eat mine with some extra honey, as the taste is quite tangy and requires a little sweetening. The honey isn’t necessary though, but you do need to add it to the yogurt to give the cultures something to feed on. The yogurt will last in the fridge for up to 2 weeks. If you’re just starting out, add it in TINY amounts every day to allow your body to get accustomed to it. The cultures are powerful and you need to be careful. I overdid it on my first go-round, which was a very silly thing to do. It was just so tasty! So glad you blanched your own almonds. I was afraid to buy blanched almonds, as they most likely have molds or mycotoxins which I am very sensitive too. But seeing how easy it is, I can buy super fresh whole almonds and blanch and process them myself. I tried the SCD goat milk yogurt and can tolerate in small amounts, but being that I quickly become sensitive to many foods, I need to constantly have variety and not eat ANYTHING for days and weeks in a row. It will become a food sensitivity. So I will try almond milk yogurt. I am currently sensitive to nuts, but this in small amounts, may be OK. Thanks. I look forward to your every post. As I get discouraged, it is good to hear of someone else’s journey. As for that competition… K totally won.